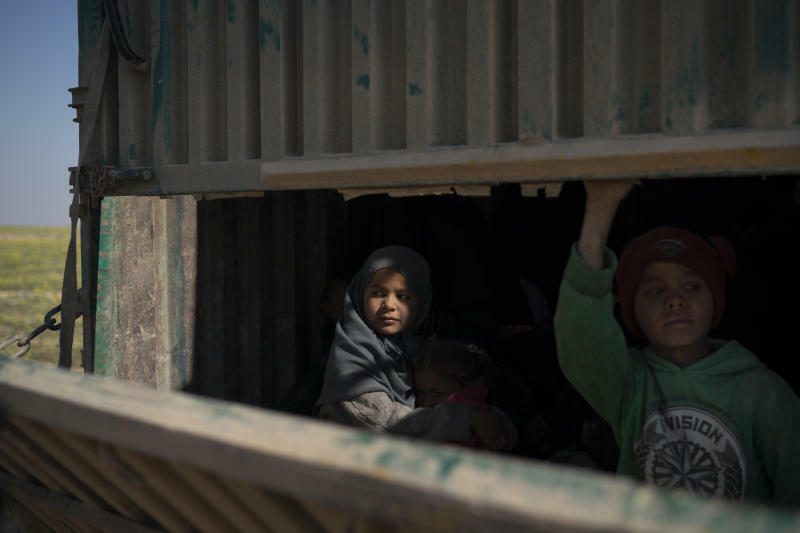 Their condition pointed to the squalor that IS has been reduced to in the tiny tent camp on the banks of the Euphrates River. 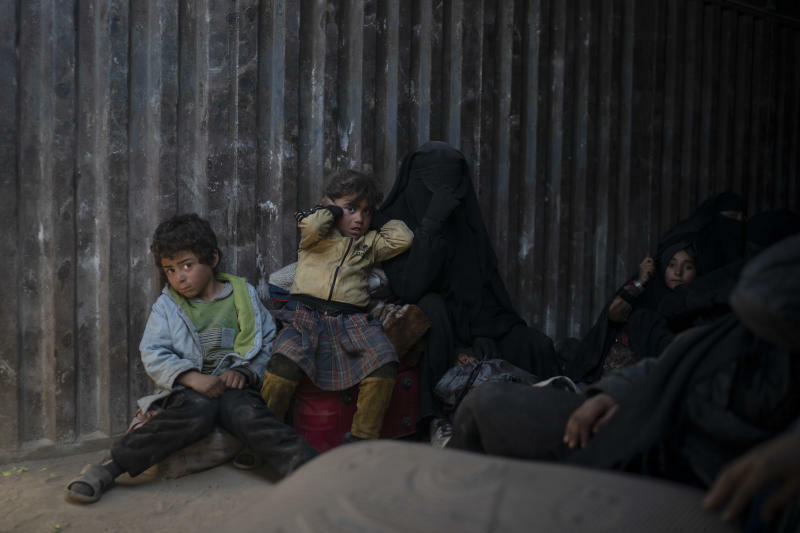 Food and water have been running out in the pocket, where some 300 IS militants along with hundreds of civilians — believed to be mostly their families — have been under siege for more than a week by U.S.-backed forces. 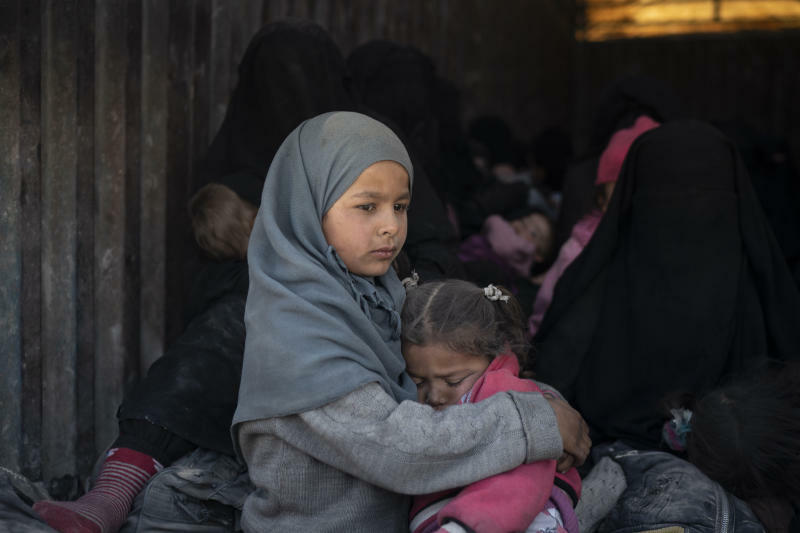 Conditions have been so bad that at least 60 people previously evacuated from the militants' shrinking territory subsequently died of malnutrition or exhaustion. The U.S.-backed Syrian Democratic Forces surrounding the patch of land have been unable to carry out a final assault on it because of the presence of the civilians. It was unclear how after days of militants preventing civilians from leaving, the organized evacuation of hundreds was possible. SDF officials did not say how many were in the convoy or how many remain in the pocket. Adnan Afrin, an SDF spokesman, said a number of IS fighters were hiding among the civilians evacuating the enclave and were later arrested. He didn't elaborate. SDF officials said clashes overnight, airstrikes and special operations facilitated the movement of the hundreds of civilians toward exits already designated by the SDF and trucks that had already been sent for evacuation. Witnesses said there were overnight strikes in the enclave. SDF officials said earlier that some militants asked for an exit, a request they declined. Instead, they said a military operation would follow the evacuation and separation of civilians. The enclave's recapture by U.S.-backed Syrian fighters would spell the territorial defeat of IS and allow President Donald Trump to begin withdrawing American troops from northern Syria, as he has pledged to do, opening a new chapter in Syria's eight-year civil war. Few believe, however, that ending the group's territorial rule will end the threat posed by an organization that still stages and inspires attacks through sleeper cells in both Syria and Iraq. In past weeks, nearly 20,000 have walked for hours through a humanitarian corridor to exit the militants' last patch of territory along the river. Many paid smugglers and some have come under fire from the militants for attempting to leave. Evacuations had been halted last week when the militants closed all the roads out of the tiny area. But on Wednesday, at least 22 trucks normally used to transport livestock emerged from enclave. Inside the truck beds of corrugated metal and iron slats, families huddled, the adult women hidden under long black robes and veils, some with crutches next to them. A wheelchair stood empty in a crowded truck bed, where a dozen children mixed with their mothers. Some of the women and men turned their backs to journalists along the road to avoid being photographer. Girls as young as nine were wearing headscarves. Many of the children looked terrified. One little girl with a stony look cradled a younger sister, who buried her face in her chest, her eyes tightly shut. Another frightened girl in the lap of a woman covered her ears as if trying to muffle the sound of an explosion. Some boys hung onto the metal as they leaned out the back, staring in confusion. One boy covered his face in the ground of the truck. The exiting civilians were not screened and it was not clear if they included militants. Some of the men with thick beards, their heads wrapped in checkered keffiyeh scarves, defiantly looked out at journalists along the road. One man wore camouflage gloves and a backpack. SDF fighters escorting the convoy did not allow journalists to speak to the civilians. But one man, responding to a shouted question how things are, shouted back, "It will remain, God willing" — a reference to the Islamic State group's slogan, "Remaining and Expanding." The civilians who were in the enclave were believed to be mainly family members of IS militants, many of them foreigners. For months they have been fleeing as the militants' bastions fell one after another until ending up in the tent enclave near the town of Baghouz. In Wednesday's evacuation, they filtered out through a gap in the earthen berm surrounding the camp — with IS fighters watching from one side, SDF fighters from the other only a few dozen meters (yards) away — and then they boarded the trucks, one of the drivers told the AP. "There are many civilians inside, regrettably," said Mustafa Bali, spokesman for the SDF said. "I think there are still many more. Our (special forces) units are doing their job to complete the evacuation." He said the militants have two options: either to surrender or "the battle will continue to the end." Some 300 IS militants — many of them foreign fighters — are believed to be holed up in the enclave in the remote village of Baghouz, along with several hundred civilians believed to be mostly family members. The Islamic State group has been reduced from its self-proclaimed "caliphate" that once spread across much of Syria and Iraq at its height in 2014 to a speck of land on the countries' shared border. There were reports of IS militants surrendering, but the U.S.-led coalition said those reports could not be independently verified. In a tweet, it said the SDF continue to receive civilians attempting to escape to safety and the most hardened IS fighters still remain in Baghouz.